Dolls are curious things – they hold a fascination for their ability to be both attractively cute and yet quietly unsettling. Many children love playing with dolls, but their appearance of cold little figures with unmoving faces has long made them a popular choice for scary stories (think of Child Play’s Chucky and Fats the ventriloquist dummy in Magic). A Stephen King has noted, “dolls with no little girls around to mind them were sort of creepy under any conditions”. It is perhaps time, therefore, that this popular horror motif made an appearance in a book by noted ghost story writer Susan Hill. She has duly obliged by writing Dolly, which was aptly published shortly before Halloween this year. In Dolly, we meet two cousins – Edward and Leonora – who are sent to spend the summer in the Fens with their Aunt Kestrel. Kestrel, a childless older woman widowed at a young age, is unfamiliar with the ways of children but anxious to make sure that they enjoy their stay with her and her Danvers-esque housekeeper, Mrs Mullens. Edward, eight years old and orphaned, is a polite and obedient child, seeming oddly “opaque” to his aunt, but written off as a “namby pamby” by the blunter Mrs Mullens. Leonora, meanwhile, is quite the opposite. The daughter of a beautiful but arrogant mother who travels the globe in pursuit of her various husbands and lovers, Leonora is a spoilt and outspoken child, damaged by her mother’s alternating neglect and luxuries. Mrs Mullens thinks she “has a devil in her”, and at one point, Leonora is apt to agree. As the summer progresses and Leonora’s August birthday approaches, presents from abroad begin to arrive from her wayward mother: clothes that don’t really fit, ornaments not suitable for a child, all thrown aside with anger, disgust or indifference. In short, everything but what Leonora really wants: a doll of her own. Kestrel thinks to offer a gesture of kindness to her niece by buying her a doll during a trip to London. The result is a day that will live with all three of them for a long time – an outpouring of rage from Leonora at finding the doll to not be the one she had imagined, leaving the toy thrown into the fireplace by its new owner, the sound of its china skull cracking staying with young Edward for a long time afterwards. He rescues the doll and takes it back to his room, thinking to mend it for his cousin and perhaps make things well between her and Aunt Kestrel. He pushes the box containing the doll and the broken china under his bed and tries to sleep, but instead is kept awake by a strange sound in the otherwise quiet night. A muffled crying and the rustling of tissue paper come from the doll’s box, which only stops when he opens it and find the doll unmoved, starts a torment that will last into adulthood. She certainly does keep us in her power. I sat down intending to dip into the novella, but ended up reading the whole thing in one sitting, my spine nicely tingling with the atmosphere the book created. This is not a scary story in the Stephen Kind mould, but rather one that unsettles and shocks the reader, and makes you feel quite glad to be reading it on a sunny afternoon rather than when in the house alone of a dark evening. While this isn’t the most original of ghost stories – I could see the conclusion creeping closer from quite a distance – books don’t have to be completely original to be effective and absorbing. Hill has shown once again why she is one of the best writers of ghost stories currently around. With thanks to Profile for providing me with this review book. 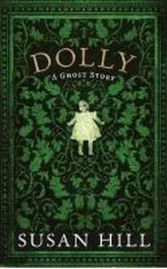 No Comments on "Dolly: A Ghost Story"